I've been participating in kirtan (Hindu devotional call-and-response singing/chanting) for two years now, and in honor of my leading a kirtan song for the first time last night (March 4, 2011) I am sharing this video of George Harrison (my favorite Beatle!) singing My Sweet Lord, a song dedicated to Krishan, Rama, Vishnu, and other deities in the Vedic/Hindu tradition, but also (I believe) to all deities everywhere for they all are within YOU! The Concert For Bangladesh was the event title for two benefit concerts organized by George Harrison and Ravi Shankar, held at noon and at 7.00 p.m. on August 1, 1971, playing to a total of 40,000 people at Madison Square Garden in New York City. Organized for the relief of refugees from East Pakistan (now independent Bangladesh) after the 1970 Bhola cyclone and during the 1971 Bangladesh atrocities and Bangladesh Liberation War, the event was the first benefit concert of this magnitude in world history. It featured an all-star supergroup of performers that included Bob Dylan, Eric Clapton, George Harrison, Billy Preston, Leon Russell, and Ringo Starr. In many languages the words breath and spirit are connected. My earlier article is on the many traditions which believe that God/Creator breathed the animating spirit into human beings. See The Breath and Spirit of Life. Today's column is related in that it presents a list of words from many cultures and languages that have the double meaning of breath and spirit or life force. In the last post I talked about all the ways people over the centuries and around the world have found to speak to God. Today, I list many of the ways people hear God. This can be a rather controvercial topic. Hearing what God has to say is called Divination, and that's a very dirty word with some people. I don't know though. If you are going to go through all the trouble of speaking to God, isn't it right and respectful that you should listen, or don't you think God will respond? God does respond, and a couple of the terms for that response are "oracle" and "divination." The following definitions are from the pages of the Online Etymology Dictionary. oracle c.1384, "a message from a god, expressed by divine inspiration," from O.Fr. oracle (12c. ), from L. oraculum "divine announcement, oracle," from orare "pray, plead." In antiquity, "the agency or medium of a god," also "the place where such divine utterances were given." This sense is attested in Eng. from c.1400. divine (v.) originally "to make out by supernatural insight," early 14c., from L. divinus which also meant "soothsayer." Hence, divination (c.1374), from O.Fr., from L. divinationem (nom. 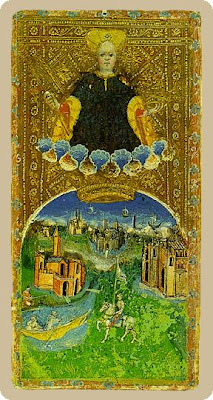 divinatio) "the power of foreseeing, prediction," from divinatus, pp. of divinare, lit. "to be inspired by a god." -mancy combining form meaning "divination by means of," from O.Fr. -mancie, from L.L. -mantia, from Gk. manteia "oracle, divination," from mantis "seer, prophet, soothsayer," related to mania "madness, frenzy." Maybe that's why divination is frowned upon, it implies madness or frenzy! As you will see, that can be a component, but certainly isn't necessary. A friend and I had the discussion years ago on the topic: "How do people hear God's message?" The answer we came up with was: "Whatever way you are most likely to be listening for it!" That means that there is no wrong way, no evil way, no way that can be frowned upon or discarded as worthless. It all depends on how you listen! You know we are all unique, and you know that people speak to God in different ways, prayer, chanting, singing. Why shouldn't we hear God in different ways, too? I personally have used Tarot, Runes, Yijing (I Ching), Scrying, and Stichomancy. So, here are a few of the ways people hear God's reply. Some are ancient, some come from the middle of time, and some - like computer divination - are relatively new. All are valid for the people who use them! How do you hear God's message? Aeromancy – the prediction of future events from observation of weather conditions. Alectryomancy – using a rooster to select grains of food placed on letters of the alphabet, the letters being put together in the order in which the grains were eaten. Aleuromancy – the use of flour as a means of divination. Alomancy / Halomancy – divination by means of salt. Alphitomancy – the use of barley meal as a means of divination. Anthracomancy – divination by inspecting a burning coal. Anthropomancy – divination by the entrails of a human being. Arithmancy – divination by the use of numbers, especially by the numbers of letters in names. Astragalomancy – divination by means of small bones or dice. Astromancy (slightly different than astrology) – divination by means of the stars. Austromancy – divination from observation of the winds. Axinomancy – divination by means of an ax or hatchet. Belomancy – divination using arrows drawn at random from a quiver or other holder. Bibliomancy – divination by interpretation of a passage chosen at random from a Bible. Botanomancy – divination by means of plants, especially sage and fig leaves. Capnomancy – divination by means of the ascent or motion of smoke. Cartomancy / Chartomancy – divination using cards. Catoptromancy – divination of health by means of regarding one's face in a mirror submerged in water. If the image was distorted or ghastly, it was an ill omen; if fresh and healthy, it was favorable. Cephalomancy – divination by means of a head or skull. Ceromancy – divination by dropping melted wax into water. Chaomancy – divination by means of appearances in the air. Cheiromancy / Chiromancy – palmistry. Chronomancy – divination of the best time to do something. Cleidomancy / Clidomancy – divination by use of a key, keys. Cleromancy – casting of lots as a means of divination. Coscinomancy – divination by means of a suspended sieve. Crithomancy – divination by scattering grain, meal, or flour over sacrificed animals. Crystallomancy – divination by means of a crystal. Cubomancy – divination by throwing dice. Cybermancy – divination by computer. Dactyliomancy – divination by means of finger rings. Daphnomancy – divination by means of the laurel. Demonomancy – divination by demon. Empyromancy / pyromancy – divination by fire or smoke. Gastromancy – (a) A kind of divination, by means of words seemingly uttered from the stomach. (b) A species of divination, by means of glasses or other round, transparent vessels [i.e. 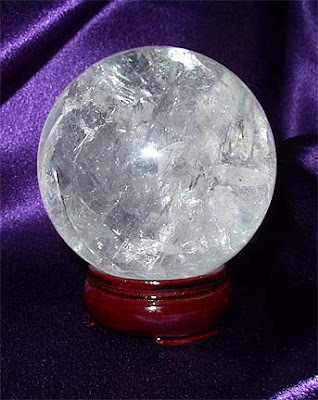 crystal ball], in the center of which figures are supposed to appear by magic art (i.e. scrying). Graptomancy – divination by handwriting. Hieromancy – divination by observing the objects offered in sacrifice. Hydromancy – divination by means of the motions or appearance of water. Ichnomancy – divination by footprints. Lecanomancy – divination practiced with water in a basin, by throwing three stones into it, and invoking the demon whose aid was sought. Lithomancy – divination by means of stones or stone talismans. Logomancy – divination by words. Meteoromancy – a style of divination by meteors, chiefly by thunder and lightning, which was held in high estimation by the Romans. Metopomancy – divination by physiognomy. Molybdomancy – divination by the motion of molten lead. Myomancy – divination by the movements of mice. Narcomancy – divination using sleep, especially eliciting information from a sleeping person. Necromancy – divination through communication with the dead. Nomancy / Onomomancy – divining the destiny of persons by the letters of their names. Oinomancy / Oenomancy – divination by wine. Omphalomancy – divination by means of a child's navel, to learn how many children the mother may have. Oneiromancy – divination through dreams. Onychomancy – divination by the finger nails. Ophidiomancy – divination using snakes, by their manner of eating or by their coils. Ornithomancy – divination by means of birds, their flight, etc. Pedomancy – divination by examining the soles of the feet. Pegomancy – divination by fountains. Pessomancy – divination by pebbles, stones, rocks. Psychomancy – divination by means of communication with souls or spirits. Pyromancy – divination by fire or by forms appearing in a fire. Rabdomancy / Rhabdomancy – divination by means of a rod or wand, especially in discovering ores, springs of water, etc. (i.e. dowsing). Rhapsodomancy – divination by means of verses. Scatomancy – divination by excrement. Sciomancy – divination by means of shadows; by communication with shades of the dead. Sideromancy – divination by burning straws on red-hot iron, and noting the manner of their burning. Spodomancy – divination by means of ashes. Stichomancy – divination by lines, or passages of books, read at random. Stigonomancy – divination by writing on the bark of a tree. Tephramancy – divination by the ashes of the altar on which a victim had been consumed in sacrifice. Theomancy – a kind of divination drawn from the responses of oracles among heathen nations. Uromancy – divination based on urine. Xylomancy – divination by wood. If you are a kirtan enthusiast or someone who's interested in learning more, please do check out and LIKE the Kirtan Community on Facebook, FOLLOW the Kirtan Community blogsite if you can. Enjoy a new virtual kirtan gathering or satsang each week. Kirtan is Vedic/Hindu devotional call-and-response singing in Sanskrit. It's also called Bhakti Yoga, the Yoga of Devotion, since the purpose and reason for singing/chanting in this style is to show devotion to and unite with God/ Universe/ Source. I've been singing with the Bend Kirtan Community since February 2009 and have found it to be very healing, and very transcendental. 2015 Update: The practice of Kirtan ultimately led to a pilgrimage to India from October through December of 2012. You may learn more about that on the book page of my website: Pilgrimage To India. I now reside in Boise, ID and sing with Peter and the Angel Fire Kirtan Band, and also with the Sai Baba group here. Kirtan remains one of the practices I find most beautiful and divinely connecting. George always was my favorite Beatle! Bahá'í World Faith: And if thine eyes be turned towards justice, choose thou for thy neighbour that which thou choosest for thyself. Brahmanism: This is the sum of duty: Do naught unto others which would cause you pain if done to you. Christianity: And as ye would that men should do to you, do ye also to them likewise. Egyptian (Ancient): Do for one who may do for you, that you may cause him thus to do. Hinduism: This is the sum of the Dharma [duty]: do naught unto others which would cause you pain if done to you. Humanism: Humanists acknowledge human interdependence, the need for mutual respect and the kinship of all humanity. Islam: None of you [truly] believes until he wishes for his brother what he wishes for himself. Jainism: You A man should wander about treating all creatures as he himself would be treated. Judaism: What is hateful to you, do not to your fellow man. This is the law: all the rest is commentary. Native American Spirituality: All things are our relatives; what we do to everything, we do to ourselves. All is really One. Roman Pagan Religion: The law imprinted on the hearts of all men is to love the members of society as themselves. Shinto: The heart of the person before you is a mirror. See there your own form. Sikhism: Don't create enmity with anyone as God is within everyone. Sufism: The basis of Sufism is consideration of the hearts and feelings of others. If you haven't the will to gladden someone's heart, then at least beware lest you hurt someone's heart, for on our path, no sin exists but this. 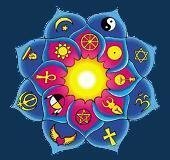 Unitarian: We affirm and promote respect for the interdependent of all existence of which we are a part. Wiccan: An it harm no one, do what thou wilt. Yoruba: (Nigeria): One going to take a pointed stick to pinch a baby bird should first try it on himself to feel how it hurts. Zoroastrianism: Whatever is disagreeable to yourself do not do unto others. Tolerance is warm. It reaches out the hand of friendship in spite of all differences. Tolerance towers above differences. It is bigger than race, color, creed, or politics. Defining religion must take into account the fact that there are several different types of religion in the world. They are all similar enough to come together in the category called religion, but they are also different enough that exploring these sub-categories is helpful in understanding religious beliefs and religious phenomena. One thing which is important to note is that these categories are not all mutually exclusive. This means that it is not the case that a religion must be a part of one and thus cannot be a part of any of the others. Quite the opposite is true, actually - it isn't unusual for a religion to be a part of two or even more groupings. These aren't so much means to divide religions into different categories as they are means to understand the ways in which religion manifests itself in human society and human psychology. Those systems known as nature religions are often considered among the most primitive of religious beliefs. "Primitive" here is not so much a reference to the complexity of the religious system (because nature religions can be very complex); rather, it is a reference to the idea that nature religions were probably the earliest sort of religious system developed by human beings. Also commonly described as Law-giving Religions, the Revealed Religions are those which find their symbolic center in some set of revelations handed down by a god or gods. These revelations are normally contained in the religion's holy scriptures which, in turn, have been transmitted to the rest of us by specially revered prophets of the god or gods. Salvation religions are typically founded by a prophet or religious leader who creates a basic doctrine which explains to people how salvation might be achieved. The legitimacy and long-term authority of these prophets is often dependent upon possessing a high degree of personal charisma and, sometimes, the ability to work miracles - presumably a sign of divine favor and sanction. 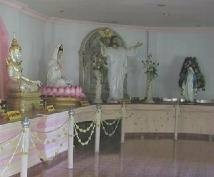 A sacramental religion is one which emphasizes or focuses upon the idea that the divine is thought to be present in some fashion in physical objects in the presence of believers and the mystery-laden ceremonies which believers participate in. Indeed, contact and communication with the divine is sought principally through those objects and ceremonies. A Prophetic Religion is strongly associated with Revealed Religion and there are times when the two terms may be used interchangeably, but they aren't exactly the same. In a prophetic religion, the role of prophets over and above the actual divine revelations is given a special status. The prophets exist to guide and warn society when it stumbles - thus, they are thought to play an ongoing and dynamic role which the static text of a revelation cannot readily achieve. A Mystical Religion is one in which mystical experiences play the most important role in terms of understanding nature, learning about the divine, and becoming a religiously devout person. At its most extreme, it excludes all other concerns with life, society, and fellow believers - it is unsurprising that mystical religions which remain mystical religions alone do not often result in coherent and long-lived religious traditions. A Tribal Religion may be best understood in terms of what it is not: it is not one which claims to have a religious message for all of humanity, it does not offer any means of universal salvation, it does not purport to have a unique insight into the will of any gods, and it does not expect anyone else to care very much about what it has to say. Your Guide to Agnosticism / Atheism. It is my long-held belief that even though we may tread upon diverse spiritual paths, we are all "climbing the same mountain" as they say, taking different paths toward the same end - spiritual connection and enlightenment. As a stress management consultant, I know that oftentimes stress is not about the things that bury you in feelings of overload, anxiety, and depression. It is about your reaction to those things, how you deal with them. They can certainly pile up into what seems like insurmountable problems. Having a solid spiritual foundation can give you the added strength to cope with many headaches, dilemmas, and obstacles. If you are feeling stressed-out and spiritually adrift, I want to help you. After spending decades finding my own True Path, I formed a very solid spiritual foundation while gaining knowledge of many practices and cultures. I honor all spiritual paths. All the symbols and all the books from all the different religions are here together in one place and the page hasn't blown up yet. Get It?! 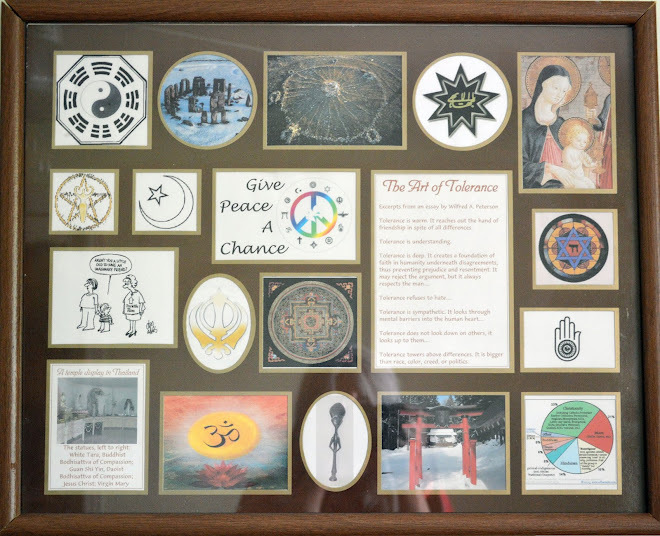 How many of the sixteen different religious symbols can you identify? "This test is not to determine what religion you should follow... But, based on your personality and what you already believe to be true, I can tell you which religious leader you would get along with most."